The Roguelike. Named after the 1980 computer game Rogue, a subset of role-playing games where a lone adventurer wanders through a dungeon to slay the evil monster at the very end or some similar goal. 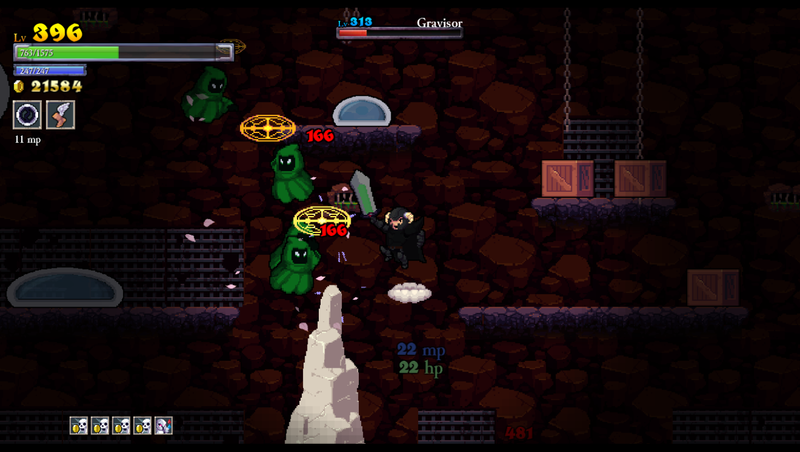 These games often encourage exploration for resources and carefully choosing your battles, as death usually means having to restart from the very beginning. 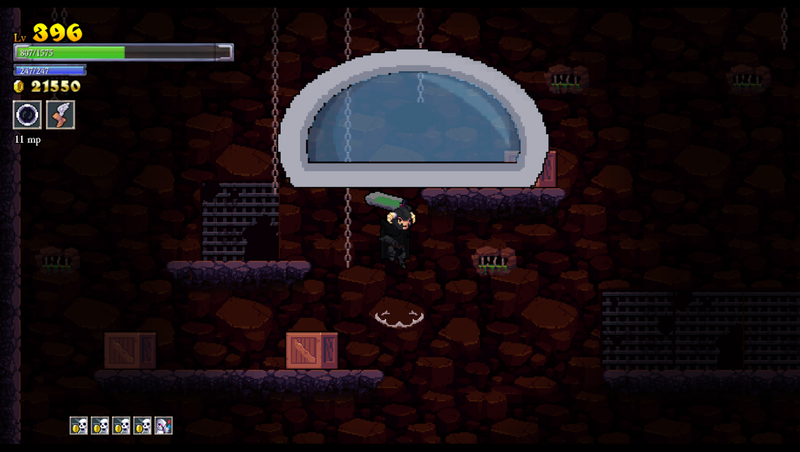 Most notably, Roguelikes generate completely different level layouts for each new game you play. 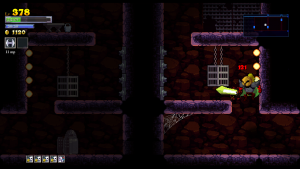 The Metroidvania: Named for Metroid and Castlevania (specifically referring to Symphony of the Night and most Castlevania games throughout the 2000’s), a type of action-adventure game that takes place within a gigantic map interconnecting several areas. These games mix a steady element of fighting enemies with exploration of the map, often to find hidden goodies that power your character up. 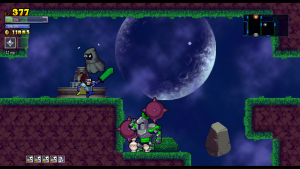 RPG elements in Metroidvanias like leveling up and building stats through equipment have been popular ever since Symphony of the Night. Basically, the Roguelike is peanut butter, the Metroidvania is grape jelly, and Rogue Legacy is the bread to sandwich these elements together into a tasty treat. Cellar Door Games, the creators of several rather clever titles on Kongregate such as Don’t S**t Your Pants and I Have 1 Day, this fledgling Canadian company wanted to step up their game with a product worth paying for. 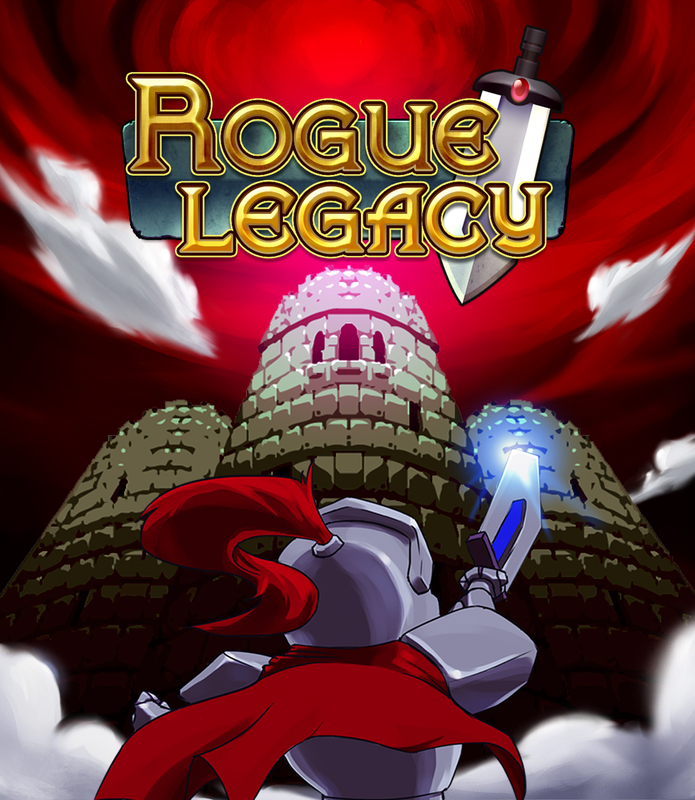 Billed as a “genealogical rogue-lite,” Rogue Legacy takes the concepts of the Roguelike and Metroidvanias and distills them down to a point where they can be combined and not totally overwhelm players. 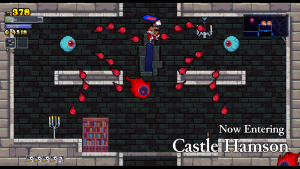 Its plot is ostensibly minimal, where you play as a knight who treks into the mysterious Castle Hamson, an eldritch building which constantly alters its architecture not unlike the “creature of chaos” that is Dracula’s castle. Your parent, also a knight, journeyed into the castle but never returned, leaving their unfinished business in your care. Thus, you trek into the castle to see what’s what, but it is very likely you will die too, thus leaving the adventure to your own descendent. And then their offspring, and then their offspring’s offspring, and so forth. Rogue Legacy is a game where death is inevitable. Arguably, it is even encouraged. Your main goal is to defeat the four bosses of Castle Hamson and its adjoining areas: The Forest Abkhazia, the Maya, and the Land of Darkness. 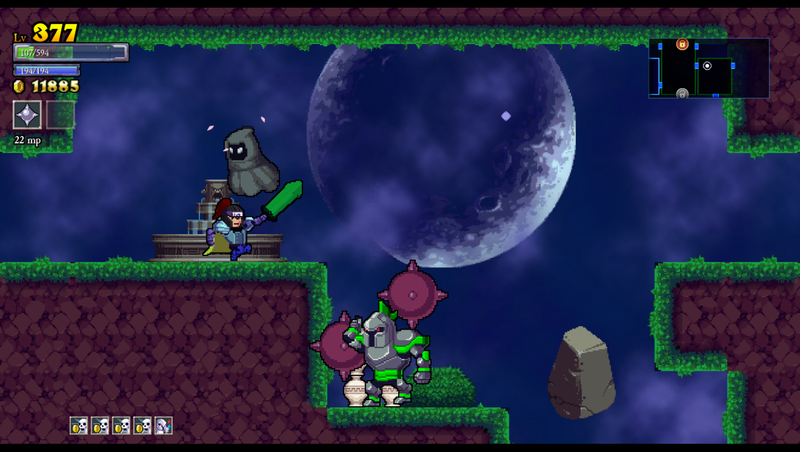 Your knight carries a big sword in a perpetually doofy fashion, raised towards the skies while marching about heroically. Such bravado makes it unfortunate that your first earnest attempt will likely end in being murdered by the castle’s monsters or traps. Whenever this happens, you get to play god and choose one of three different descendants with randomized traits. All knights have their sword and a randomly-decided spell for a subweapon, ranging from familiar daggers and axes to scythes, bladed chakram, and more esoteric attacks. Each new child will be one of ten classes, such as knaves with increased critical hit chances, barbarians with super-high hit points, and spellthieves with the ability to steal magic points by hitting enemies. 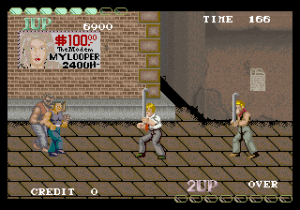 They will also have one or two traits picked out of a possible thirty-five, some of which are beneficial (gaining magic points for destroying objects), detrimental (flipping the entire screen upside down), or just goofy (swearing every time you get hit and when you die). After picking your next hero, you’re off to Hamson, where your goal should ideally be focused more on finding gold than fighting the bosses. 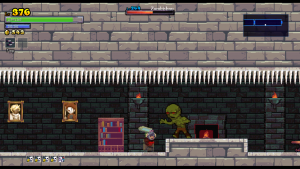 Various enemies stand in your way such as evil knights, floating skulls, immovable zombies, elemental wizards, possessed paintings and other such demons. Enemies sometimes fork over gold when defeated, but you don’t actually gain experience points from them. Your gold IS your experience for all intents and purposes, and you can also collect money from the many treasure chests strewn about. However, some chests require you to navigate through spikes and/or fire traps to reach, and others require you take no damage or they lock up and become unobtainable. 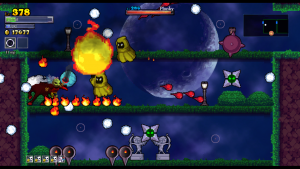 These are “fairy chests” which contain blueprints or runes which can add stats and abilities to your characters. 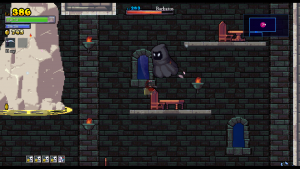 Sometimes, you have to avoid taking damage, or you have to not hit enemies, unable to jump, reach the chest before a timer runs out, and so on. 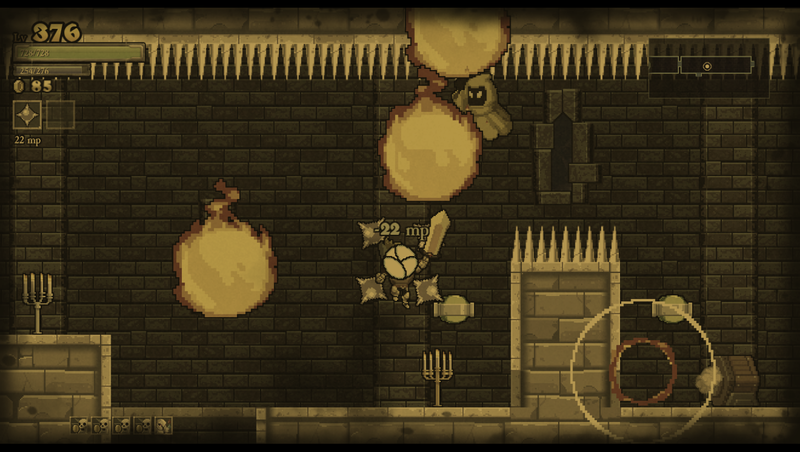 For as much gold and equipment as you collect, death is very likely to happen unless you’re an action-platformer super-wizard. This is where the gold you’ve grabbed comes into play, as you get to do some remodeling after picking your next descendant. Your gold goes towards upgrades, which also causes new rooms to be built into your house which, in turn, causes more upgrades to appear. As your humble home grows into a fantastic fortress, you get access to all sorts of upgrades including increasing your maximum hit and magic points, boosting the amount of gold you can collect, and unlocking and upgrading new classes by giving them unique class-specific abilities. No one knows exactly how a dead explorer’s gold is mysteriously passed onto their offspring, but future generations of heroes grow stronger through home improvement instead of conventional experience points. Three of the earliest upgrades you should get are to unlock the smithy, enchantress, and architect for hire, and these personnel will be found outside of the castle gates. The smithy puts blueprints you’ve found in the castle to good use by offering you new swords, helmets, chest armor, limb armor, and capes. These enhance your offense, defense, magic, and can give you special abilities like increased critical hit chance and draining health from slaying enemies. The enchantress can add runes to pieces of armor that give you even more specialties, like being able to dash, double jump, fly, get more gold, and move faster among other attributes. Finally, the architect can “lock” the castle you’ve previously explored and leave it exactly as it is. 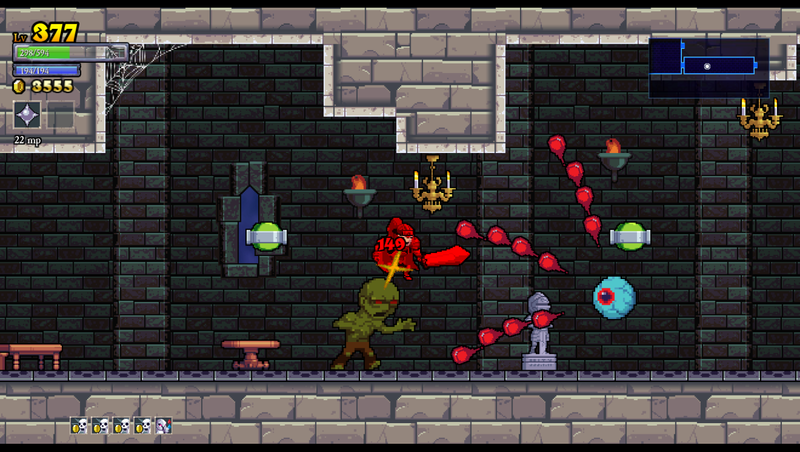 Normally, re-entering the castle completely changes its layout true to Roguelike form, but if there’s any reason you want to keep the castle as it is, the architect’s almighty bolt keeps last journey’s map exactly as it was. The caveat is that he takes 40% of the gold you grab for your next run, so you’ll have to consider whether stability is worth a stunted gain of 60% cash. There’s also one more figure outside the castle gates who’s there whether you want him to be or not: Charon, the castle doorman who shares his name with the boatman on the river Styx. True to his mythological roots, he requires payment for entry into the castle, which unfortunately means all your gold by default (though one castle upgrade reduces him to only taking a percentage of your cash). Thus, it’s encouraged that you spend as much as you can before getting back to the action. 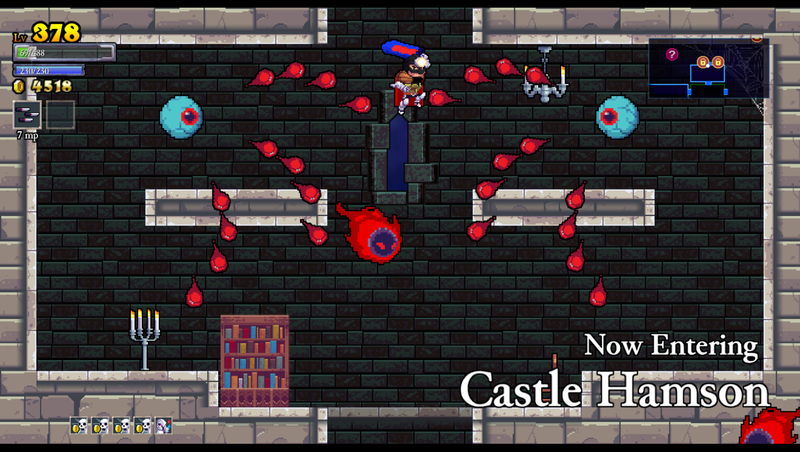 There are several other things to watch out for in each castle besides money and equipment, like journal entries that shed some light on the backstory, mysterious statues that give you special items that stay with you until the next death, a trollish clown that gives you rewards if you can beat one of his difficult minigames, and even giant paintings that give information on Cellar Door’s past projects. 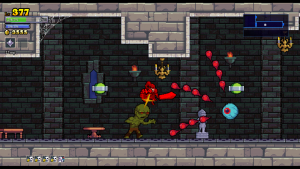 Above all else, what you’ll most want to be looking out for are the boss rooms, which have teleporters in them in case you lose and want to have the architect lock the castle for quick re-access. 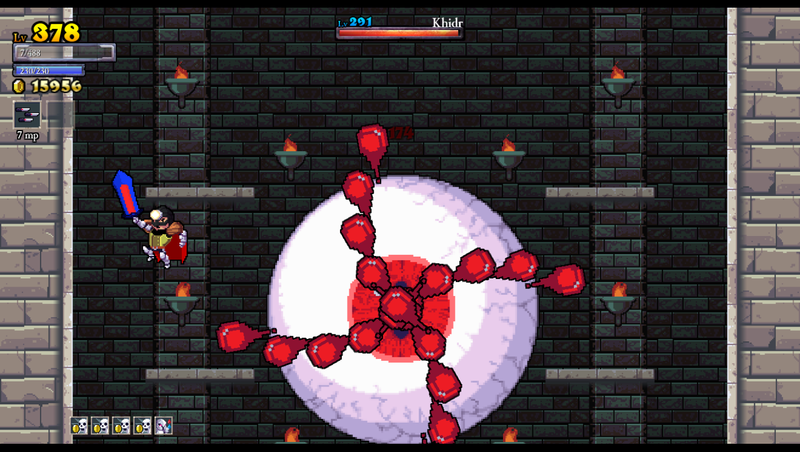 The boss fights can be quite overwhelming when you first face them; for instance, the first boss, Khidr, is a gigantic eyeball that shoots out projectiles in patterns not too far removed from a bullet hell shmup. 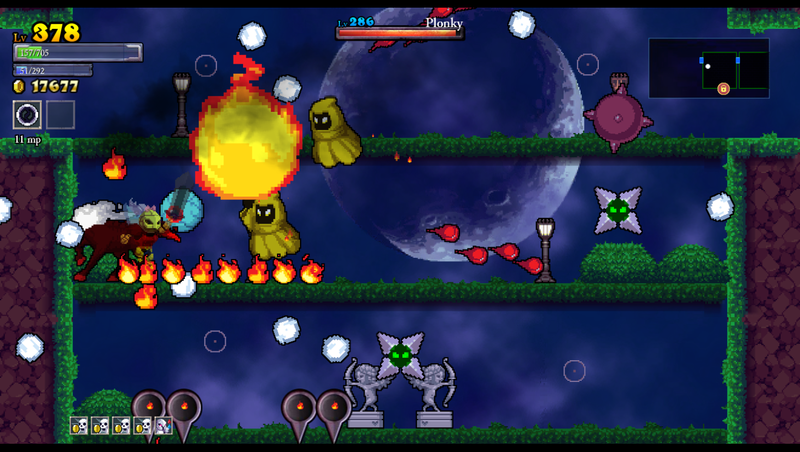 All bosses are technically much bigger versions of normal enemies and may share some familiar behaviors, but they all provide tough challenges that will likely require several upgrades to defeat. 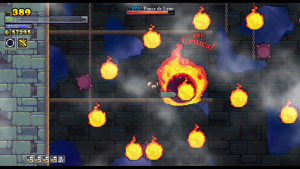 Thankfully, destroying a boss is the only thing about the castle that stays locked once you’ve done it, so you don’t have to take on all four in the same run. Once you’ve conquered all four bosses, the ominous door in the castle’s first room opens up and you face the final boss, whose presence brings the normally muted plot full circle into a surprisingly dramatic conclusion. Now on paper, Rogue Legacy may sound like a frustrating game to some. 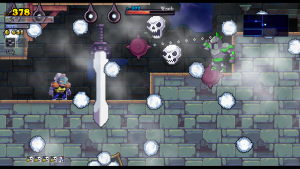 Games where you’re expected to die a lot don’t always jibe with everybody, but Rogue Legacy runs on a different engine than the likes of N+ and Super Meat Boy. 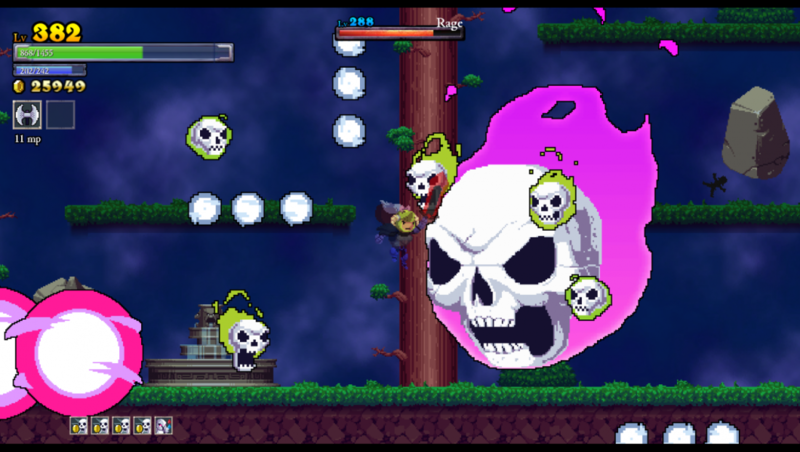 It does have some masocore elements to it, like rooms lined to the edges with spikes and enough projectiles to make Cave jealous, but Rogue Legacy doesn’t want you to lose and give up. What really brings it together is the solid upgrade system, which encourages you to spend smart and frequently lest Charon make your efforts forfeit. 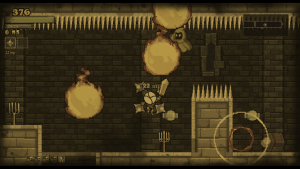 Even if you don’t kill a boss in a run, your efforts never feel truly wasted as long as you can obtain at least one upgrade. Not only do you grow stronger by spending, but natural practice also helps to learn what monsters you fight and of what they’re capable. 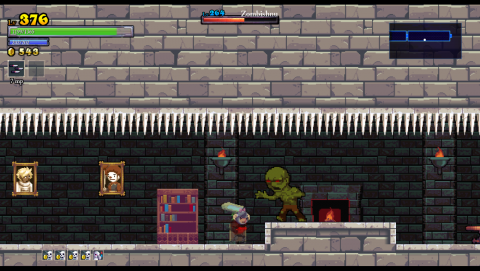 Rogue Legacy is like a durian where it seems rough and prickly on the outside, but within is an odd-smelling but strangely delectable fruit that tastes sweet once you get used to it. It’s certainly no pushover, and the mandatory character randomization may be deterring for some who prefer their games to be a little less chaotic. Yet the randomization is what shapes the game’s personality and mostly silly nature; where else can you play as a dwarf lich who sees the castle walls as computer wireframes? 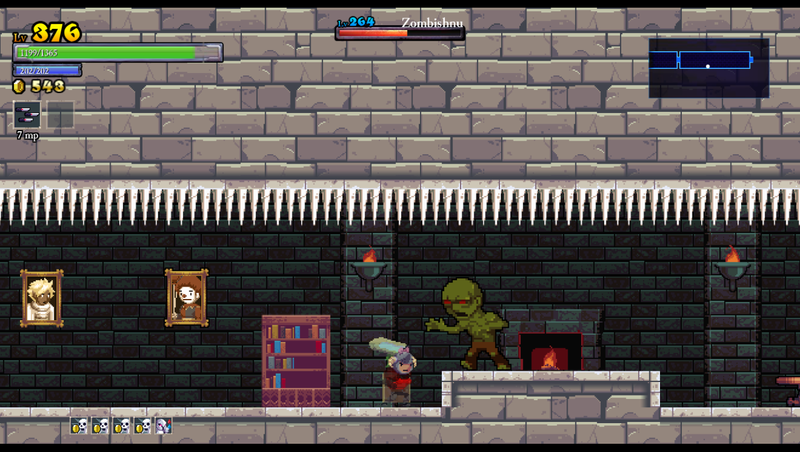 Or how about a bald ninja who’s so clumsy that they destroy castle objects merely by touching them? The map randomization isn’t much of a factor thanks to the architect, though that gold penalty might be a bit of a sting for anybody just looking to boost their experience points.